Mammoth Mountain ski resort was recently named one of the top 10 ski resorts in North America by Ski magazine. There are many reasons why it is one of the best of the best. Located in the Sierra Nevada range of eastern California, Mammoth has one of the longest ski seasons in the United States, running from November through June. In fact, the resort's longest season was in 1994-95, when the resort opened on October 8 and closed August 13, thanks to an incredible amount of snowfall. With more than 400 inches of annual snowfall, the resort also boasts some of the top steeps and deeps in the northern hemisphere. Founded by Dave McCoy, a hydrographer for the Los Angeles Department of Water and Power, Mammoth officially became a ski area with an operating ski lift in 1955. 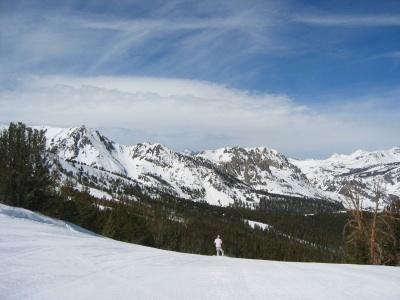 McCoy built the area on the north side of Mammoth Mountain, which is located in the volcanic Long Valley Caldera. Today the ski resort is frequented by skiers and snowboarders from Southern California. It is only a five hour drive from Los Angeles. Mammoth Mountain prides itself on "big"--big vertical, big elevation, big snowfall, big on sunshine, and big terrain parks. Not only does the ski area boast some of the best expert terrain for skiers, it also has no less than seven terrain parks, including an 18-foot tall Super Pipe and a 22-foot Super-Duper Pipe.The mountain's Unbound Terrain Parks are so legendary that Olympic skiers and snowboarders, such as 2006 gold medalist Shaun White, hang their helmets here. Comprised of seven parks and three pipes, Unbound boasts more than 90 acres of terrain and features park and pipe rides for every level of skier or snowboarder. Beginners can try their legs out at Disco Park where small bumps and jibs offer a chance for newbies to get an idea of what terrain parks are all about. More advanced or experienced riders can hit South Park and Forest Trail Park to practice before taking on the major hits and jibs of the gnarly Unbound Main Park. Only for those with the skills to conquer it, the Super-Duper Pipe is one mammoth-sized halfpipe. This 22-foot-tall, 500-foot-long and 62-foot-wide behemoth is one of only a handful in the world. It attracts snowboarders from all over the world who want to challenge their skills. For those who don't downhill ski or snowboard, there are many other activities to choose from, including cross country skiing and snowmobiling. Mammoth's scenic Lakes Basin is the ideal escape for cross country skiers. The beautiful tree-lined area offers 19 miles of freshly groomed skating, classic and snowshoeing trails for every ability. It is a wonderfully scenic and peaceful way to take part in the Mammoth experience. Even if you have never been snowmobiling, Mammoth Snowmobile Adventures is willing to take you for the ride of your life. With extremely experienced guides, and top of the line equipment, a snowmobile trip will provide you and your family with unprecedented access to some of the most beautiful, pristine backcountry in the world. No ski resort would be worth a top-ten ranking unless it also offered fantastic nightlife, as well as high end dining and lodging options. Mammoth, being a favorite hangout for Los Angeles residents, has some excellent choices for all of these essential amenities. Lakanuki: A hip mountain tiki bar might sound like a strange anomaly, but the fish tacos, hula dancing and tropical drinks make this a favorite spot for visitors. Whiskey Creek Mountain Bistro: Beer lovers celebrate with local brews by Mammoth Brewing Company. A fantastic after-hours scene with live music is a must-have for visitors. Auld Dubliner: Every town needs an authentic Irish pub. This version pours Guinness on tap and provides Irish fare like corned beef and Shepherd's Pie. Side Door Cafe: A cozy setting and top vintages make this spot feel like a European wine bar. Petra's Wine Bar: Casual, yet sophisticated, Petra's offers an extensive wine list and incredible California cuisine. There are a couple of different options available for fine dining on Mammoth Mountain. If you are looking for a stunning dining experience, check out Lakefront Restaurant at Tamarack Lodge with California-French-inspired cuisine. There are only 10 tables in this dining room, so service is impeccable and the food is renowned. For a more unique dining experience try the Parallax Snowcat Dinners. This is the ultimate dining adventure at 9,600 feet, where diners start with a champagne reception followed by a luxury snowcat ride that takes you high on Mammoth Mountain to Parallax. The Village Lodge: Modern rooms that range from studio to three-bedroom condos. Located in the center of town. Juniper Springs Resort: A contemporary resort designed just for families this resort is a favorite ski-in, ski-out destination. Mammoth Mountain Inn: Just a short walk from the gondola and Main Lodge, this inn is full of condos and suites for families and large parties. Tamarack Lodge and Resort: Historic rooms and cabins on the shore of Twin Lakes provide access to groomed cross-country trails.